After finding out that I was pregnant with a Girl, it didn't take long before jumping right into decorating her nursery. I wanted to create a space that could grow with her, as well as would be calming, feminine and simplistic, all done on a very small budget. Living in military housing, we were not able to paint any of the walls, so adding personality and character to a very blank slate of a room with white walls was a challenge. 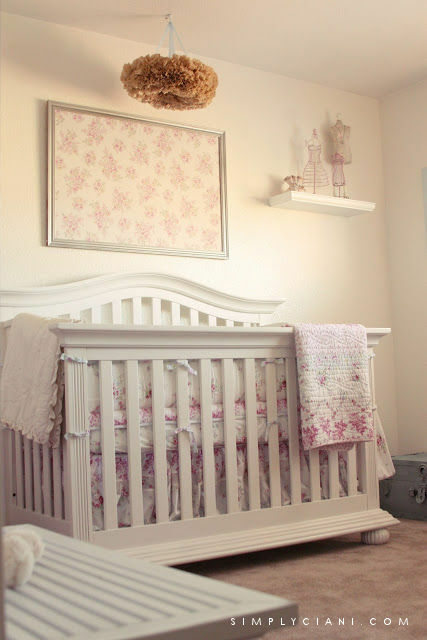 I knew that I wanted to go with a shabby chic feel, so my first step was to find a crib and furniture to set the mood for the base of the design. The crib ended up being a special gift from my grandmother. She was there with us, along with my whole family, at my ultrasound appointment to find out the gender of our baby. Nearly everyone was convinced it was a boy, so when the ultrasound technician announced "it's a girl!" we were all in shock, in a good way. We all went to lunch together after then headed off to go shopping for the perfect crib. Being on a small budget, we started our search at a local children's furniture shop in San Diego that was going out of business. Off in the corner was this beautiful crib. It was a floor model and had some discoloring on the back side of the spindle slats but other than that, it was everything I had ever wanted. 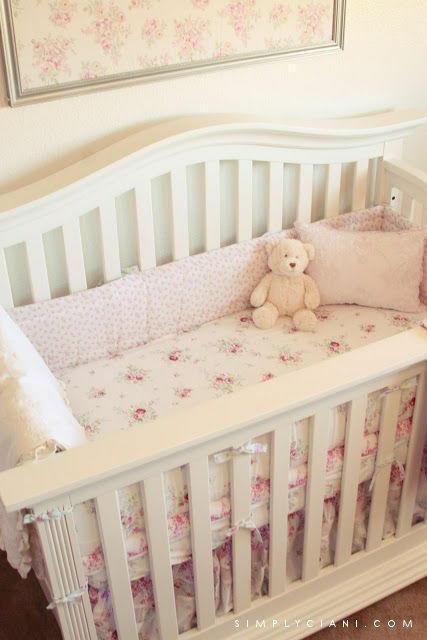 I loved the curved feminine back, and the fact that it was a 3 in 1 crib, which transitions into a toddler bed, then a full. The pricing was at the top end of what I had wanted to spend, but we could still make it work. 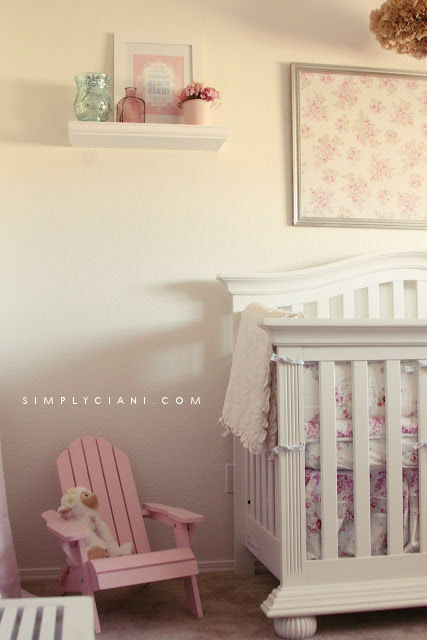 Originally this was a $899 crib, which we were able to get for $320! At checkout, my grandmother graciously stepped up to pay, and gifted it to us. A gift I will forever cherish. For those that are wanting to know more about the crib brand and style, unfortunately there ended up being a recall on this specific style and is now discontinued, so I do not have a link. 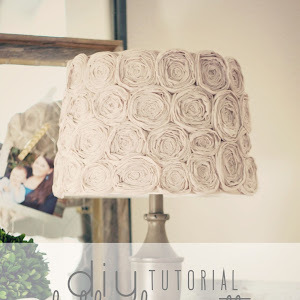 But I have linked similar styles at the bottom of this post that all have great reviews and are small budget friendly! As for the bedding, my vision was all things floral and traditional shabby chic. I was able to find this shabby chic floral crib bedding set from Target for just $119! 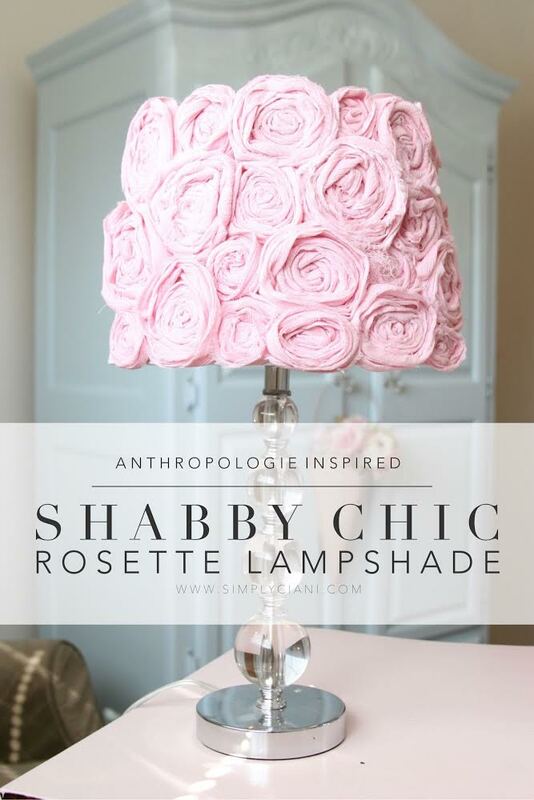 Unfortunately it is no longer available and while I was not able to find anything identical to link, I did do some shopping and found a handful of other shabby chic styles that are adorable and affordable! The embroidered pillow was created by my sweet Aunt for baby M. The vintage baby dresses were a thrift store find for $2 each. The gallery wall frames are all from Michael's, I then filled the larger 2 with vintage book pages from a children's picture book that I found at a local antique store for $4 and the smaller frame holds baby M's birth announcement which I created using Minted.com. Lastly, the large wooden frame on the wall was a Home Goods find for just $12 on clearance. Creating little special vignettes is my favorite thing to do, photographing them is probably my second favorite. I love bringing personality into a room using a mix of old and new finds. This plain white picture frame was another one that I found at Michael's then just hot glued a pink bow to it. 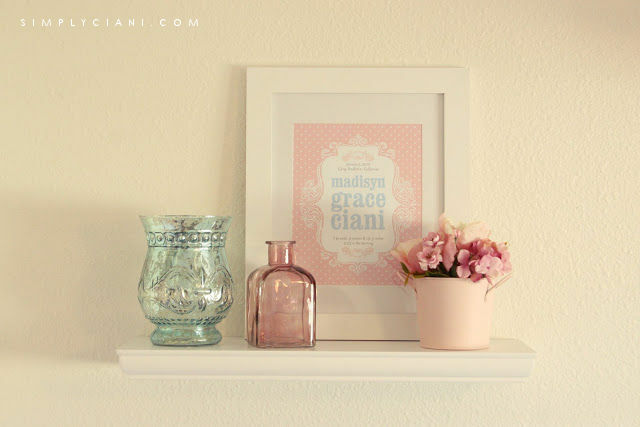 The mason jar was a local antique find, and the glass vase and faux florals were again from Michael's. Have you seen the collections of mirrors from Pottery Barn Kids, that literally almost cost as much as the crib bedding that I purchased... Well, as much as I loved them, they were not in mu budget! So I found a way to DIY them. 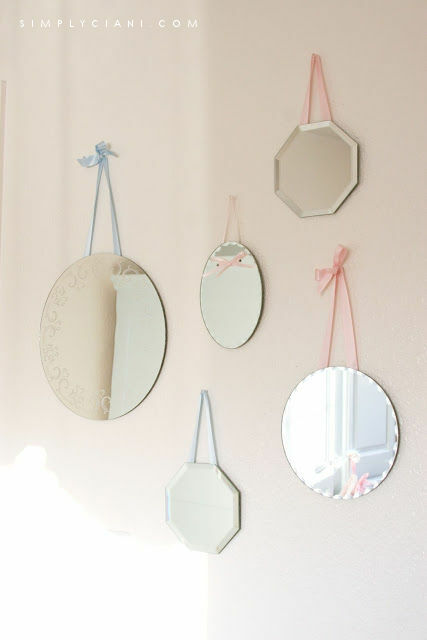 I found all of these mirrors at Michael's for $2-$7 (for the largest one), along with the ribbon that coordinates with the pink and blue color scheme in the room. I hot glued the ribbons to the backs, and hung! It was that easy and cost me under $25 for all 5 of them. This monogrammed canvas was another DIY done by yours truly. 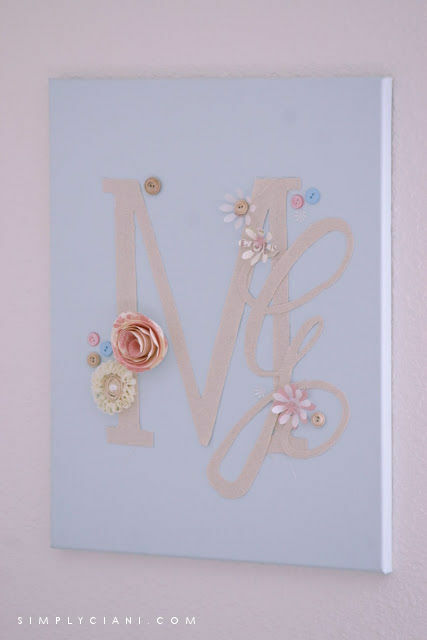 I painted the base of the canvas using the same paint that her blue armoire is painted in, then using drop cloth fabric, I drew my letters onto it, cut them out and hot glued onto the canvas. I finished it off using flowers I had made out of paper and old buttons. This entire project cost me less than $10 to create. Here is another perfect example of mixing old and new together. The largest dress form on the right is from TJMaxx, the one on the left is also new, from Michael's, and the one shown in the center is an antique one. The porcelain vase on the left belonged to my great-grandmother Jenny and holds such a special meaning being in my baby girl's nursery. Again, living in military or rental housing has it's restrictions, and when it came to the ugly big brown closet doors... I wanted them gone! 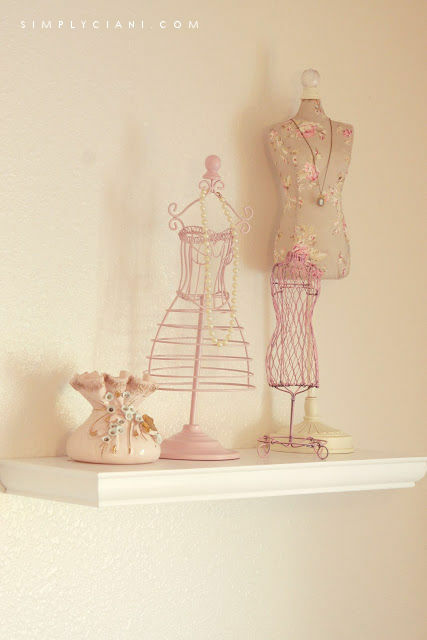 We were easily able to take them off of the track without damaging them, and it their place I hung a set of pink satin curtains from the Simply Shabby Chic line at Target onto a tension curtain rod then placed the rod up into where the closet tracking is to hide it all. This is a great solution for anyone who is renting. When we moved out, we just placed the doors back in and it was exactly how it was when we moved in! 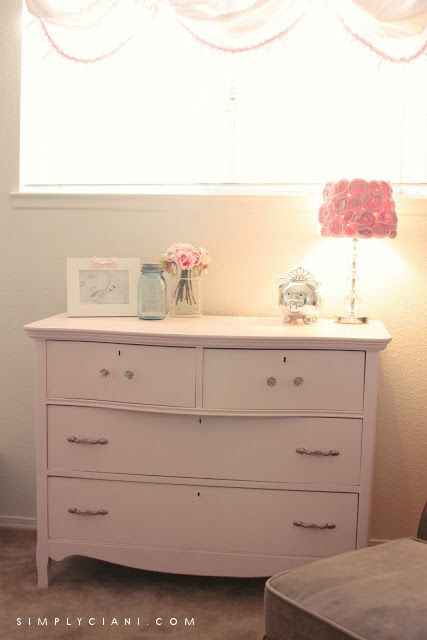 Another tip for all of you military housing/ rental dwellers, because we often are not allowed to paint, you can bring in color by painting your furniture. 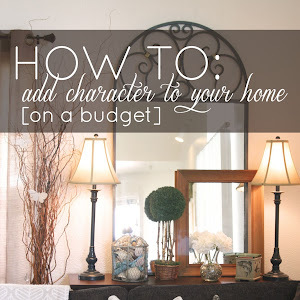 This is so simple to do and will completely transform the look of a room on a small budget! 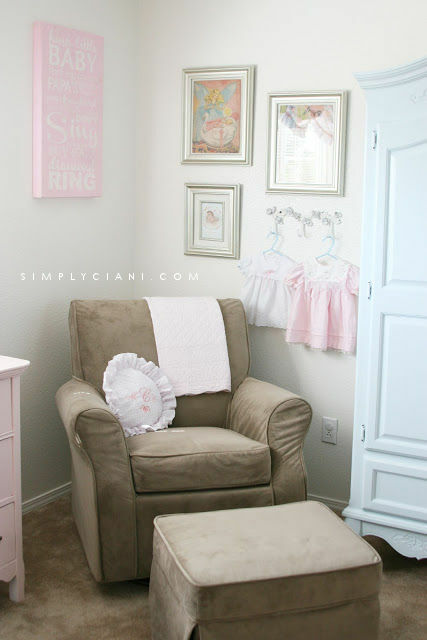 Lastly, to fill the large white wall space above her crib, I took a shower curtain (you could also use a sheet) from the Simply Shabby Chic line at Target, stretched it over a large piece of cardboard and hot glued it on the back side. I then placed the fabric covered cardboard into a large thrift store frame that I had spray painted silver. This whole project only cost me basically the price of a shower curtain. Such a great bank for your buck! Thank you! For the paint, we used a Valspar semigloss. I cant remember the name of the color though :-/ And, the hardware is from Target! 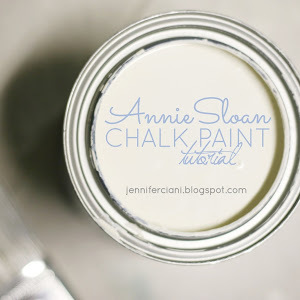 Just came across your blog and LOVE all the beautiful decorating I'm seeing! I've got to ask, how did you paint the dresser? Did you sand or prime it before painting? 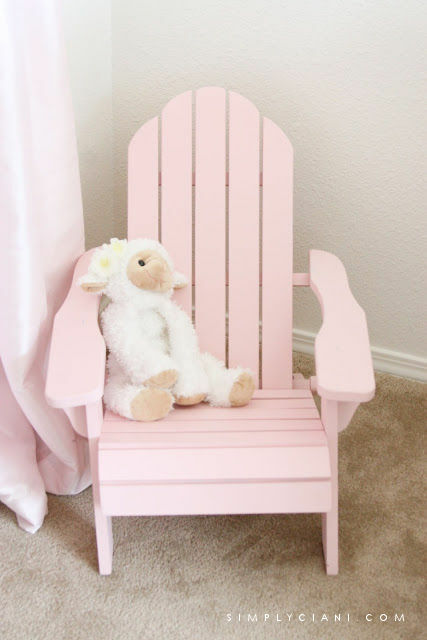 I'm getting ready to do the same thing for my sons furniture, but trying to get all the hints and tips first. :) Thanks! Hi there! I came across your blog through Pinterest. 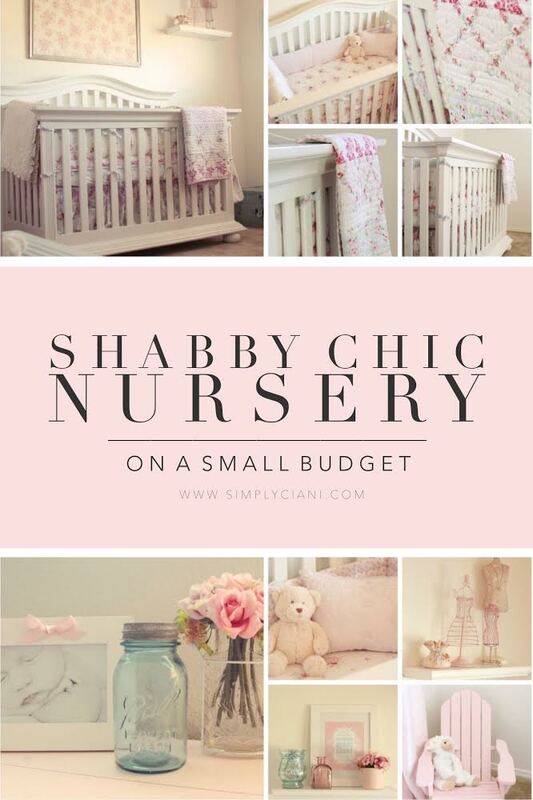 I am looking to do a shabby chic nursery for my little one on the way; I was wondering where you got your bedding? Is it the one from Target? Love your furniture refinishing, too!!! Great job! Thank you! 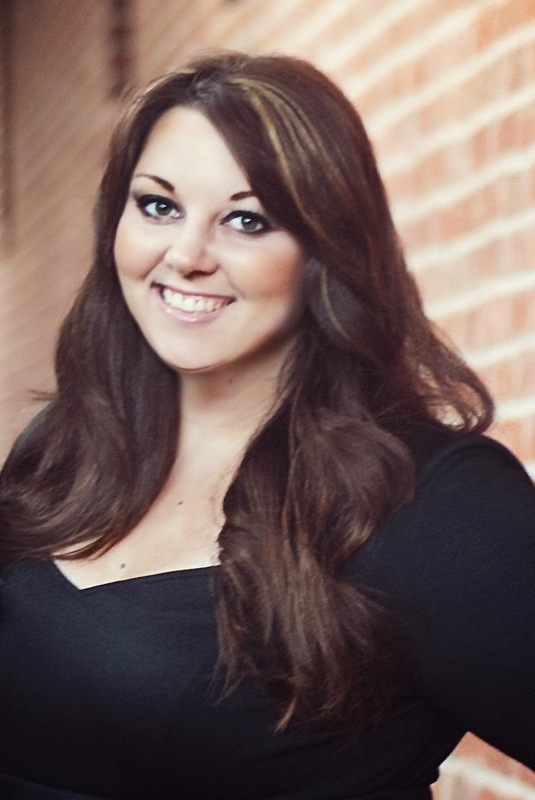 I will follow your blog! 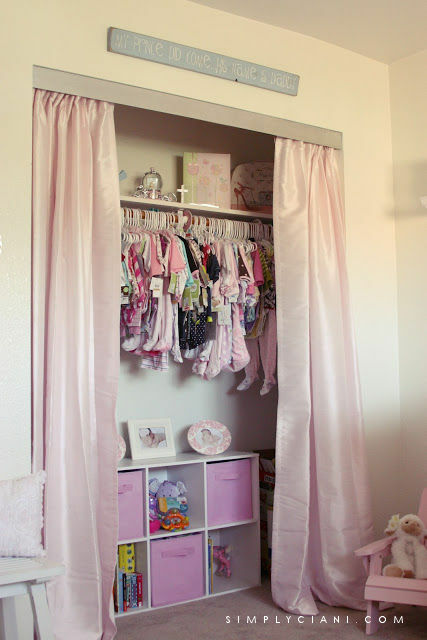 Loooove this baby room!!! You have a wonderful talent! 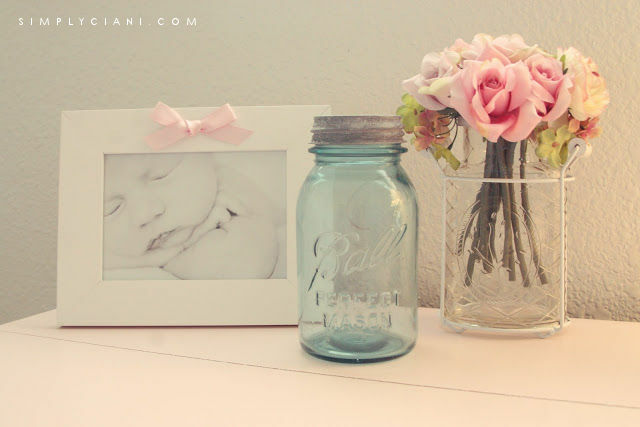 Hi - I am trying to find out where you got what looks like a birth announcement featured in a silver frame with a circular picture of your daughter and flowers surrounding her? Thank you! LOVE it all..........your ideas, your photographs, your passion, your story. Fabulous job! Can you tell me where you found the mirrors set of 5? The mirrors I made myself, I used mirrors found at Michael's in all different sizes and shapes and then just attached ribbon to the back with hot glue! Where did you find the lamp? I absolutely love the little bird with the bow. Did you make it or find it somewhere? 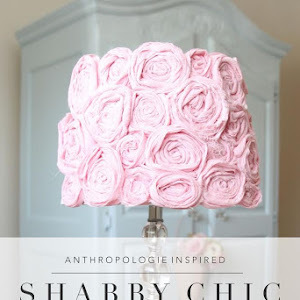 I just found your blog through Pinterest and LOVE it! We have very similar styles :) Can't wait to dive in further. Love this room. Any chance you remember where the pink cone flower basket is from? LOVE the crib. Where did you purchase it at? I love this so much! Where is the bedding from? It is exactly what I am looking for! Can you please tell me where the crib is from? I'm looking for something like this! Thank you!! Where did you find that crib? Absolutely gorgeous! !